Water! Or more specifically, oysters. Naturally occurring in warm tropical regions including Tahiti, Phillipines, Broome (Western Australia). Cultured in Japan and China. Of all the precious stones found in jewellery, pearls are clearly different to the rest which is certainly part of their enduring appeal! Unlike any other gem, pearls are formed within a living organism – an oyster. The oyster reacts to a foreign object entering its shell by wrapping it in layers of ‘nacre’ – also known as Mother of Pearl. Because so many variables must take place for this event to happen in nature, a perfect naturally formed pearl is incredibly rare. Rather, today, pearls are cultured – still grown within oysters (or freshwater mussels), but with a little help from us to create the right conditions. The main difference is that natural formed pearls add layer upon layer of nacre around an irritant that has naturally entered the oyster, while cultured oyster pearls have the nacre layered forming over a bead inserted in the oyster by man. Over the centuries, the allure of this ‘living gem’ has remained strong. 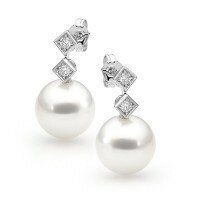 In ancient Greece, it was believed that to wear pearls on your wedding day would result in a happy marriage with few tears! The lustre, size, colour and surface flaws all combine to give a measure as to the quality of a pearl. The largest and most highly sought-after pearls are South Sea Pearls and Tahitian Pearls. Jacqueline Kennedy Onassis was renowned for her beautiful strings of pearls, as were many British Queens and ‘Queen of Hollywood’, Elizabeth Taylor. Her famed La Peregrina pearl was a large pear-shaped natural pearl that had belonged to Queen Mary I.
Pearls are particularly popular in necklace designs. From ‘collar’ and ‘choker’ length through to ‘princess’, ‘matinee’ and ‘opera’ lengths. There are eight basic shapes: round (the most desirable), semi-round, button, drop, pear, oval, baroque and circled. Due to their fragility and relative lack of hardness, these delicate stones should only be wiped with a soft dry cloth. Avoid exposing your pearls to perfumes, hairspray, alcohol and/or heat. Tahiti, French Polynesia. (Other black pearls cannot be called ‘Tahitian’). 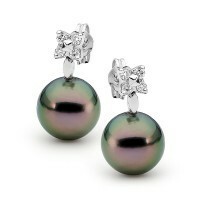 With their distinctive dark complexion, the Tahitian pearl is among one of the world’s most impressive gems. As well as the pearl itself, the actual shell is soughtafter for its appearance – and was almost hunted to extinction up until the early 20th century. Cultured pearl farming of this oyster species did not begin until the 1960s, but now thrives throughout French Polynesia. Among the largest in the world, with an average diameter of 11mm, some as big as 20mm. White, silver, pink, gold and combinations of these. There are two varieties of South Sea oyster, and they will only grow one pearl at a time (although multiple ones over many years). They are distinguished by their edge colour of the shell – or ‘mother of pearl’, which also lends its hue to the pearl itself. The large Pinctada maxima shell and longer growth period (minimum two years) help the resulting beautiful specimens to become so big. The rich lustre of the South Sea pearl is unique and comes from the extra thick nacre coating – up to 10 times thicker than other pearls. It’s not an oyster at all. Freshwater pearls form in mussels in lakes, ponds and rivers. Small-average, Japanese ‘Biwa’ pearls have been noted as larger. Freshwater pearls differ from their saltwater counterparts in a number of ways. Most obviously, they grow in a non-saline environment, in mussels rather than oysters. They do not contain a nucleus bead – instead formed solely of layers of nacre, making them very durable. However, without this nucleus, they tend not to be as round or lustrous as their ocean-dwelling cousins, but are still popular for their affordability and toughness. China leads the way in freshwater pearl production, with more than 1500 tonnes annually. Freshwater pearls today are much higher quality due to the widespread switch from the inferior Cockscomb mussel to the Triangle Shell in the 1990s. This, along with better manipulation processes, has reinvigorated the industry.